When I travel to Europe, motorcyclists are amazed that American riders can simply stroll into a motorcycle dealership and pay for any machine they desire, without any required training. In England, for example, new riders are restricted to motorcycles displacing just 33 horsepower for the first year, and once they pass an extensive exam allowing them access to a big streetbike of 600cc or more, many riders enroll in track-based training to help them deal with potentially hazardous situations. Welcome to Pittsburgh Rides, our regular feature on motorcycling. Here we bring you the latest in rides, trends and events, but we need your input. We're looking for voices from the local biking community willing to share (in roughly 500 words) your experiences on the road and what you think is hot on wheels. Send your story or pitch to Weekend editor Scott Mervis at smervis@post-gazette.com. Mike Seate, left, and T.S. Tamarra take on the turns at BeaveRun Motorsports Complex. But keep in mind, superbikes are not evil, as many cruiser riders suggest. It's just that they're being sold without the proper instruction. And although Americans are unlikely to submit to the stringent testing requirements that make Europeans much safer riders, there is a handy solution if you've got more motorcycle between your knees than you know what to do with. Just 35 miles north of Pittsburgh in Big Beaver Borough is BeaveRun Motorsports Complex, a veritable playground for two-wheeled speed freaks. 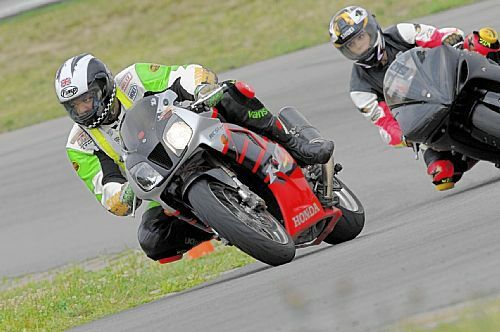 Between April and November, BeaveRun's 1.6-mile Wilson circuit holds classes for streetbike riders hoping to master their 170 mph superbikes. The fees aren't cheap and neither is the gear required to ride on a closed-course; a set of full leathers, boots, gloves and helmet can set you back a good $500-$2,000 and track days range from $100 for a day of moderately supervised, open lapping sessions to $500 per weekend for professional, hands-on instruction from pro road racers. But compared to loss of life or limb or a few days in the hospital, it's a small investment. I took my first track school some 10 years back and while the sound and speed of racing motorcycles can be intimidating to newbies, a single lap at (what I then imagined) high speed without worrying about gravel, cars, traffic cops or roadside obstacles was enough to have me hooked. Exhilarating doesn't begin to cover it -- imagine the freedom to ride as fast as you like, all day with only the laws of physics to hold you back. That ambulances are parked trackside in case of falls only adds to the sense of security -- how many streets have E.M.T.s just waiting for an accident? I've since enrolled in enough track schools that I seldom feel the desire to ride stupid-fast on the streets. I've known dozens of riders who've purchased sportbikes, crashed due to a lack of technique and later sold their bikes. Had they taken a weekend to learn basics like how much brake or throttle to use in a corner or just how far their bikes can lean before running out of traction, most of them would still be riding. And taking track days. Greetings from All About Bikes! Special thanks to everyone who took the time to say hello at last weekend's track day at Nelson Ledges, Ohio! We had a wonderful time, and captured tons of video. Check out the track section at AllAboutBikes.com to see if you are one of our featured riders! One of the things that AllAboutBikes prides itself on is being part of the motorcycle community. If you have a track day coming up that you would like to invite us to, please do not hesitate to ask. We intend on increasing the amount of video coverage around these events through the season. If you would like to be a featured rider, shoot us an email too with a request to follow you! Thank you, and Safe Riding!